Amelia Lost by Candace Fleming. Grades 4-8. Random House Books for Young Readers, February 2011. 128 pages. Reviewed from ARC snagged at ALA. Biographies of Amelia Earhart. We have plenty of them, right? Famous lady disappears on a flight around the world. Years later, people are intrigued. Lots of biographies are written. But this one stands out among the crowd. This one is not to be missed. First of all, you have Candace Fleming, master nonfiction writer. She brings Amelia Earhart to life with quotes, photos, and stories about her. She takes the reader through Amelia's childhood, her family's struggles with an alcoholic father, and her dreams of flying. She includes little details that make the reader realize that Amelia Earhart was a real person (did you know that her hair was not naturally wavy? She took a curling iron to it every morning to create that tousled look!). With Candance Fleming, you know you're going to get a meticulously researched and well-written biography. The thing that made this biography stand out for me was the way that Ms. Fleming alternated the story of Amelia Earhart's life with the story of her death. When you crack open the book, the first bit is about Amelia's scheduled rendezvous with the tiny island in the Pacific where she was supposed to stop and refuel. Everyone was ready. Everyone was alert. And she didn't show up. They caught snatches of her voice on the radio, but they were unable to contact her, even though they tried many, many times. It broke my heart and brought tears to my eyes and from that moment, I was utterly engrossed in Amelia's story (even though I have read biographies of her before). And the book continues that way, giving biographical information about Amelia and then, between chapters, continuing the story of those days when she was lost. I had no idea that civilians had picked up what might have been broadcasts from Amelia's radio, even as far away as Florida. 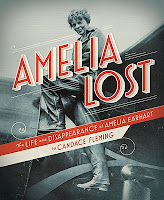 If you think you know the story of Amelia Earhart, I urge you to pick up Amelia Lost and see if you don't learn something new. This is a book that will stick with me. And I am not afraid to admit that I cried when booktalking it to my staff. Check out more reviews at A Fuse #8 Production and Reading Rants. Happy Valentine's Day and Happy Nonfiction Monday! Check out the roundup at Wrapped in Foil.